How many poos per day? Some recent information made available on the web prompts a question that we really need to get a handle on. How many poos per day in the South Loop? And where do those poos end up? A recent article in the Chicago Journal provided an estimate of “around 2500 dog owners” in the South Loop. There was no explanation of how this number was arrived at, but let’s imagine that it’s in the ballpark. How many dogs is that? Let’s suppose the average number of dogs/household is 1.5. So: 3750 dogs in the South Loop. It’s a guess, but let’s go with it. 3750 dogs are each going to poo once or twice a day. Let’s say the average is 1.5 poos/dog. So we arrive at our answer: 5625 dog poos/day in the South Loop. Again, it’s a guess, but let’s go with it. That’s a lot of poos! 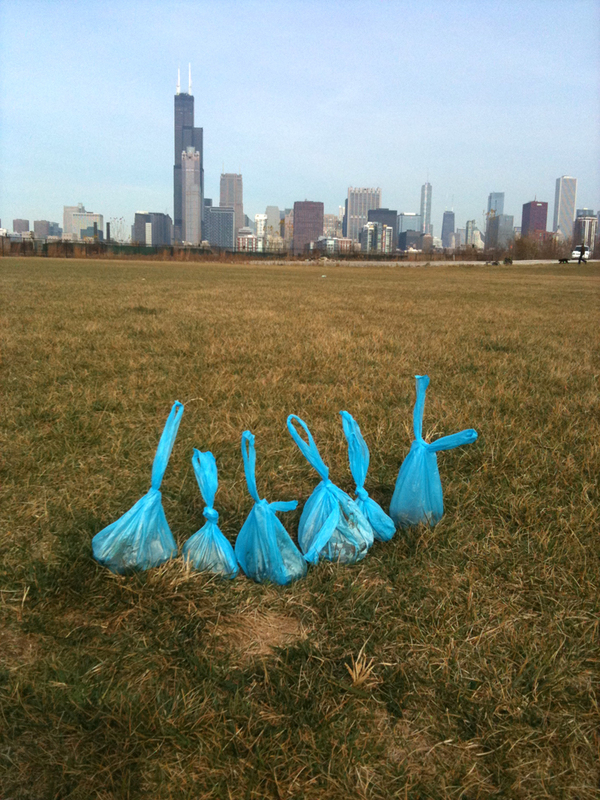 Now, the South Loop Dog PAC reported on their blog recently that they provide about 22,000 dog waste bags each year at the South Loop dog parks. As they calculate it, that’s “61 poos picked up for less than two dollars a day”. Hmmm…. 61 ÷ 5625 is about 1% of the dog poo in the South Loop. Good on ya SLDogPAC, but there’s still the 99% to worry about! By the way, if we take the SLDogPAC’s estimate of $0.032/bag, that means that if each dog-owning resident of the South Loop were given a bag to pick up their dog’s poo, it would cost $180/day.